If you are seeking a high-temperature phenolic resin that possesses excellent flexural, compressive, and impact strengths, choose phenolic glass (G-3) for your application. As an added benefit, NEMA grade G-3 laminates are capable of continuous operation at temperatures over 350°F (175°C). 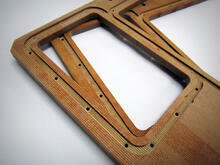 Micarta® G-3 machining is in area in which Vanderveer Industrial Plastics excels. Vanderveer Industrial Plastics utilizes ILNorplex materials, and as a result, they machine without difficulty. Several grades of G-3 are available. For additional information on G-3 plastic materials, contact your local Vanderveer Industrial Plastics representative or call Vanderveer Industrial Plastics at 714.579.7700.